Keeping the brain healthy will not be a daunting task if you learn to include the correct nutrients in your diet. Any food rich in Vitamin E is supposed to be quite beneficial for brain health. Additionally, you might need some toxin cleansers too to make sure your brain stays sharp and strong at all times. 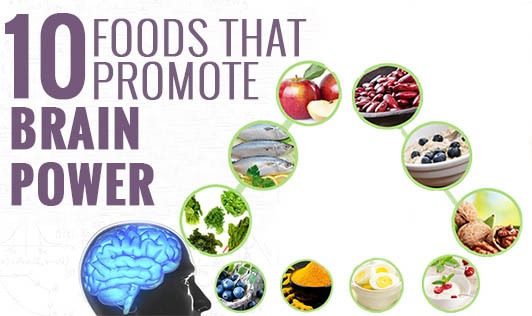 Read on to find out what foods you must eat regularly for improving brain power. Berries: Strawberries, blueberries, and other types are known sources of antioxidants and thus are very helpful in slowing down the aging process of the brain and the body. Fish: There is no arguing that vitamin E is golden when it comes to brain health. Salmon and tuna are rich sources of this vitamin which is also a powerful antioxidant. Broccoli: This superfood is rich in Vitamin K, calcium, antioxidants, and most importantly lignin, a phytoestrogen known to benefit cognitive skills such as thinking, reasoning, and imagination. Walnuts: Amazingly so, walnuts are actually shaped like the human brain! Rich in omega-3 fatty acids and vitamin E, walnuts are linked to normal brain function and a deficiency in these nutrients can be linked to depression and cognitive degeneration. Beetroot: The humble beet is a very rich source of nitrates. It channelizes blood flow to the brain effectively. Dark Chocolate: Rich, dark chocolate is quite rich in antioxidants. Now you have a good reason to indulge in some chocolate! Water: The brain tends to shrink when the body is dehydrated. It can also cause a disturbance in the balance between water and the other elements, thereby reducing the efficiency of the brain cells. So, make sure that you have ample water throughout the day. Avocado: Rich in vitamin E and antioxidants, both of which are well-known for their roles in contributing to brain health. Additionally, the fruit is also known to improve blood flow and lower blood pressure. Banana: Probably one of the cheapest and the most ubiquitous fruit, the banana is rich in potassium, a micronutrient essential for brain function, because low potassium levels can inhibit the ability to focus and think clearly. Buckwheat: A gluten-free food, this nutritious grain is certainly an effective brain booster due to the presence of antioxidants. A perfect diet is one that helps you keep fit from head to toe. So, plan your diet in such a way that it takes care of the brain too in addition to muscles and joints. Good health starts with a brighter mind.